The AAdvantage Platinum Select World Mastercard is Citibank’s travel rewards credit card for those who fly frequently with American Airlines. The card features some nice benefits like no foreign transaction fees, a great opening bonus reward, mile rewards, travel insurance, and purchase assurance. The credit card also features American Airlines flight perks like preferred boarding, airline discounts, and a free checked bag for you and up to four others. This card does have some drawbacks though, such as a high annual fee. AAdvantage Platinum Select is most beneficial for those who fly with American Airlines frequently. For others, the benefits are limited. Who is AAdvantage Platinum Select Right For? The AAdvantage Platinum Select card is designed for businesses that require frequent travel and can benefit from the American Airlines miles and other travel perks. Note: Businesses can only have one of these cards (not including employee copies). The sign up bonus is not available if you have opened another CitiBusiness/AAdvantage card within the last 2 years. Citibank’s Platinum Select World Mastercard is really useful for businesses who use American Airlines frequently. Citibank includes some nice perks like mile rewards, a big signup bonus, discounts with American Airlines purchases, and free checked bags. But, this credit card is only marketed to a slim audience, since it will not benefit those whose businesses do not require travel or who do not fly with American Airlines. From our experience, Citibank's customer service is very fast and organized. Their employees are polite and responsive, and easily answered our questions. You can contact Citibank’s customer service through phone, online chat, and mail. Citibank’s website is generally good, but their business section is outdated and disorganized. It’s also missing a lot of information, so customers have to resort to contacting customer service about small details like opening fees and interest rates. Citibank does offer a better experience for customers through their mobile app and online banking website, which has a straightforward and user friendly interface. There are some good features included with this credit card, from miles rewards, a 0% intro APR period, and a large signup bonus to travel protection and American Airlines discounts. However, their annual fee, high APR, and fairly low mile rewards per dollar spent could be improved. 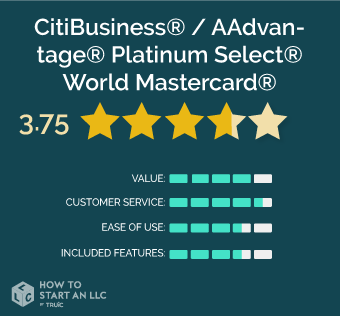 With a big sign up bonus, travel protection, American Airline miles, a 0% APR period, and many more benefits, Citibank’s CitiBusiness/AAdvantage Platinum Select World Mastercard is a good option for businesses that require travel and use American Airlines regularly.